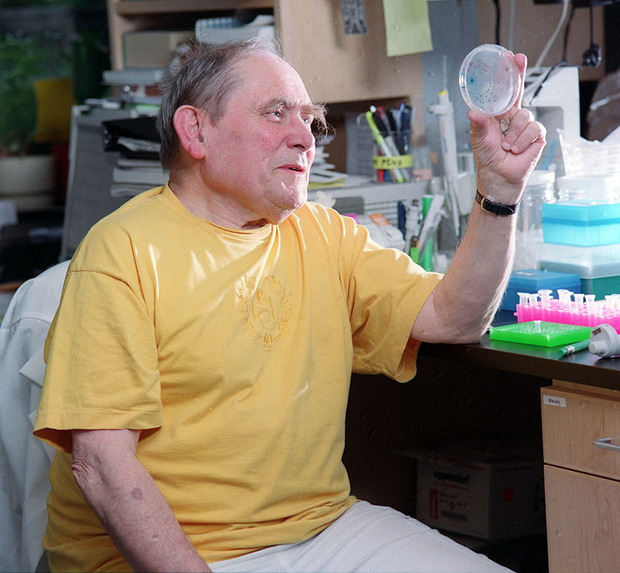 Sydney Brenner, who has died aged 92, shared the Nobel Prize in Physiology or Medicine in 2002, with John Sulston and Robert Horvitz, for their pioneering study in the 1970s on how specific genes regulate organ growth and cell death. Their discoveries shed new light on the development of diseases including Aids, neurodegenerative diseases, cancer and strokes. The story of how the three men won the most important prize in science goes back to the 1960s when Brenner, then at the Medical Research Council’s (MRC) laboratories in Cambridge, had the idea of studying the millimetre-long transparent nematode worm, Caenorhabditis elegans, in order to understand how genes control development from a fertilised egg. Decades of work had made the Drosophila fruit fly a standard organism for geneticists, but the fly’s brain was too complicated for Brenner’s purpose. He wanted an organism with a nervous system so simple that he could compute its behaviour from knowledge of the interconnections between its nerve cells. Brenner reasoned that C elegans – which consists of just 959 cells at maturity and can easily be observed with a microscope, was the perfect subject for a study of how a complete organism can be made from the genetic code of DNA. The plan was, first, “to get the wiring diagram” of the nervous system, and then to trace the lineage of each cell in the adult back through the development to the fertilised egg. Brenner’s colleagues at the MRC Laboratory of Molecular Biology in Cambridge were sceptical. Jim Watson, the co-discoverer of the DNA double helix, said the project was too ambitious – and in fact computing the worm’s nervous system was one of Brenner’s less than entirely successful ideas. After 14 years, his student John White succeeded in reconstructing the wiring diagram of the worm’s brain, but its 5,000 interconnections proved too complex for further analysis. The C elegans project bore fruit in other ways, however. In 1969 Brenner recruited John Sulston, a young postdoctoral researcher, to his team and, five years later, brought in Professor Horvitz, originally from Chicago, a mathematically trained economist with an appetite for hard data. Together, the pair mapped the precise lines of descent by which the 959 cells of the adult are generated from the single cell of the egg – an extraordinary achievement. In a series of scientific publications beginning in 1976, Sulston not only mapped the lineage of every nematode cell, he also described the visible steps in programmed cell death and demonstrated the first genetic mutations involved. Horvitz built on his colleagues’ insights with a series of elegant experiments in which he identified the first two “death genes”, ced-3 and ced-4, which play a critical role in programmed cell death, showing that the human genome also contains a ced-3-like gene. The studies of C elegans led to a fundamental reappraisal of the importance of genes in the death of certain cells during normal development, helping scientists to understand the mechanisms of disease and giving scientists hope that they could tackle the human genome. In Aids, neurodegenerative diseases, stroke and heart attacks, cells are lost as a result of excessive cell death; meanwhile autoimmune conditions and cancer are characterised by a reduction in cell death, leading to the survival of cells normally destined to die. Sydney Brenner was born on January 13, 1927 in the small town of Germiston, South Africa, to Jewish parents who had emigrated there from Europe, his mother from Latvia and his father, a cobbler, from Lithuania. Educated at Germiston High School, he was inspired with an interest in biology by a book in the public library entitled The Science of Life. As he was too poor to buy a copy, he reported the book missing and paid a small fine. At the University of Witwatersrand he read Medicine, though his true passion was biology and he completed a master’s dissertation on the chromosomes of the small insectivore, Elephantulus, so named because of its trunk-like proboscis. Brenner moved to Britain to take a DPhil at Exeter College, Oxford, on the workings of bacterial cells under the famously eccentric physical chemist Sir Cyril Hinshelwood. Hinshelwood had no time for genetics and constructed experiments for Brenner which aimed to prove that the workings of a bacterial cell could be understood in terms of chemical kinetics. Brenner knew that this was impossible and carried out his own experiments that proved the importance of mutation. He claimed to have converted Hinshelwood to his point of view, though observers noted that while the great man would reluctantly accept the evidence for a time, he always retreated to his old position. On a visit to Cambridge in 1953 Brenner met James Watson and Francis Crick, who had just discovered the structure of DNA. Crick liked Brenner’s acerbic wit and in 1956 invited him to work at the Cavendish Laboratory and the MRC’s new Laboratory of Molecular Biology, where, for 20 years, he and Crick would share an office and work together examining the properties of DNA. Among other things they established that amino acids – the building blocks of proteins – are coded by sequences of three DNA units. By deleting DNA units from bacteria, they showed that only after three units had been deleted in proximity did the DNA message come back into correct phase, proving that the units must be translated three at a time. Brenner later coined the term “codon” for a coding triplet. In 1960, with Matthew Meselson of Harvard and Francois Jacob of the Pasteur Institute, Brenner proved the existence of messenger-RNA, the transcript that carries the genetic message from DNA to the cell’s protein-making factories. In 1964 he began his work on C elegans. In 1976 Crick left Cambridge and molecular biology for America and neurobiology, and in 1979 Max Perutz retired as chairman of the MRC laboratory and Brenner was chosen as his replacement. On his motorcycle the evening two days before he started, he spotted a wallet in the road and took it to the police station. Riding sedately home, he was struck by a taxi emerging from a side street. Both his legs were badly broken, as a result of which he subsequently required walking sticks. His template reply to invitations to meetings was: “Dear X, I regret I am unable to accept your invitation as I find I cannot attend your meeting. Yours sincerely…” Aaron Klug replaced him in 1986. In the mid-1980s Brenner decided to move on to general problems of genome research and started working for a part of each year at the Scripps Research Institute in La Jolla, California, where Crick and other colleagues had already moved. Later, in 1996, he founded the Molecular Sciences Institute in Berkeley, California, before appointment as Distinguished Professor at the Salk Institute in La Jolla. In 2005 he was appointed president of the Okinawa Institute of Science and Technology. In the 1990s a new project began to take shape. As DNA sequencing progressed, it became clear that some 97pc of the human genome is “junk” DNA, material that does not code for genes and has no apparent function other than to confuse researchers. After discovering that the fugu, or puffer, fish has virtually no junk DNA, Brenner conceived the idea of sequencing the fish’s genome so as to find the genes more quickly and develop a basis of comparison with the human genome. It was not easy to obtain funding, but in October 2000 he persuaded Trevor Hawkins of the American Department of Energy’s Joint Genome Institute to collaborate with the Institute of Molecular and Cell Biology in Singapore in sequencing the fugu genome. This was jointly completed a year later. As well as his scientific interests, Brenner was a great reader and collector of books and an entertaining, if waspish, mimic and storyteller. He had a passion for words and wordplay – in a riff on Avogadro’s number, he invented “Avocado’s number”, defining it as “the number of atoms in a guacamole”. He also had an aversion to modern conveniences such as emails and photocopiers. He once asked a student who had a large Xerox bill whether he had tried “neuroxing” some of the papers. The student asked what he meant. For many years he wrote an elegant and playful column called ‘Loose Ends’ in the journal Current Biology, later changing the name to ‘False Starts’ when it was moved to the front of the publication. Brenner was appointed a Companion of Honour in 1986. In 1952 he married May Balkind (nee Covitz), an educational psychologist, who died in 2010. He is survived by their son and two daughters. A stepson died last year. Sydney Brenner died on April 5.